Treat yourself to cheap hot air balloon rides in Manchester! Have you ever dreamed of going on a hot air balloon ride and having fantastic views of the city of Manchester from the air? If so, this voucher is perfect for you! Many people think that an activity like a hot air balloon ride will be expensive and out of their price range, but with these cheap vouchers from Groupon you'll be able to have a fantastic day out! This voucher will allow you to enjoy cheap hot air balloon rides in Manchester at a price you never thought possible! Buy cheap hot air balloon rides in Manchester now! Even if cheap hot air balloon rides in Manchester aren't your thing, we all have that adrenaline junkie friend who would just love the experience. These vouchers would make the perfect gift for them, giving them up to 70% off the price! In addition to this there are plenty of other leisure offers on our website so make sure you check them out - you're sure to find something that excites you! Our offers are updated every day so check back often so that you don't miss out as more popular deals can sell out very quickly! 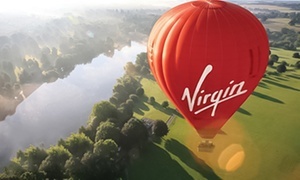 Don't delay, buy your vouchers now and enjoy the experience of a lifetime on a hot air balloon ride over Manchester!